Wild at Heart is an organization dedicated to providing low cost spay/neuter services to feral (community) cats in and around Boulder County. Through community awareness and education, we aim to reduce the number of homeless kittens being born and to improve the lives of the cats who call the streets their home. 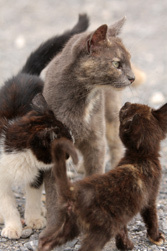 What is a feral cat? Feral cats are regular domestic cats who have had none of the socialization (interaction with human beings) that pet cats have received. Without human handling the behavior of these cats is similar to that of a wild animal. They keep to themselves and avoid interaction with people. 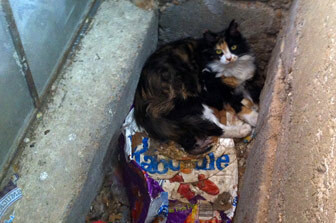 Do you see cats that match this description around your home or place of business? Have you wondered how you can help them? Wild at Heart is here to provide you with the information and tools needed to help you help these cats. We promote a program called Trap Neuter Return (TNR) where feral cats are humanely trapped, spayed/neutered, vaccinated and released back to their outside homes. With the support of a caregiver to provide food and shelter, they are able to live healthier lives without the ability to reproduce.